When Is Sedation Dentistry the Right Choice? Even worse is the damage done when dental work is postponed to the point where it seriously affects an individual's oral health and overall well-being. In addition, some people worry about dental visits because they have a low pain threshold, gag easily or simply need a lot of dental procedures. If these scenarios sound all too familiar, don't despair, and don't wait. Sedation dentistry can help you to relax and get that all-important dental care. Inhaled sedation: Also called "laughing gas," nitrous oxide is administered via mask. It allows the patient to be relaxed but awake during his dental work. Oral sedation: Typically in pill form, this is a tranquilizer such as Valium, Atavan or Xanax. Taken at home before the appointment and perhaps again at the office, this medication helps the person take a nap in the dental chair and to easily wake up when the procedures are done. Intravenous sedation: Administered through a vein, sleep comes on quickly. This is a deeper anesthesia, and it has to wear off before the individual wakes up. Both oral and IV sedation require a friend or family member to transport the patient home. Local sedation: This is Novacaine or similar injection put right at the site of the restorative work or even dental cleaning to relieve any associated discomfort. It is often given by itself or along with inhaled or oral sedation. The dentist will swab the area with a topical anaesthetic before injecting the Novacaine. Dr. Michael Flatley believes that sedation dentistry is very beneficial for individuals who have a high level of anxiety about going to the dentist. Those who choose sedation can feel relaxed and safe during their procedures and go home with improved oral health and an attractive smile. Dr. Flatley and his staff wish to encourage those who are nervous about going to the dentist to give the office a call at 253-853-4955. When appropriate, they offer free conscious sedation to all new patients. Protect your teeth against decay and gum disease in between visits to see your Gig Harbor, WA dentist. You’ve just come back from the dentist. Your teeth feel smooth and look dazzling. You only wish you could get those kinds of results from your at-home care; however, even though your toothbrush and floss might not be the same as the tools your Gig Harbor, WA dentist uses, it does not mean that there are not things you can do to keep your teeth looking and feeling their best until your next dental visit. Follow these helpful tips for keeping teeth pristine. Your Gig Harbor, WA dentist can’t tell you enough how important regular flossing is for your smile. You should be flossing at least once a day to remove food and plaque and to reduce the presence of stains. While brushing is also a crucial part of good oral hygiene, flossing is truly the only way to remove buildup and foot particles from between teeth and other hard-to-reach spots. Even if your teeth are healthy, if your gums are red and inflamed then your smile can’t look its best! What you put in your mouth is often just as important as how you care for your teeth. After all, certain foods and drinks can cause stains and produce acid, which attacks tooth enamel and weakens your smile. Therefore, to keep teeth healthy between dental visits, you will want to limit your intake of sugar, starchy foods like potato chips, coffee, tea, wine, sports drinks and other dark foods that could stain your white teeth. Opt instead for lean meats, low-fat dairy products, crunchy raw fruits and vegetables, and lots of water. Some patients find that their electric toothbrush offers them superior results; however, the choice is completely up to you. Whatever feels most comfortable is what we recommend. After all it’s your regime; however, some people find that the electric toothbrush offers the proper amount of pressure so they don’t push too hard and damage their teeth while also offering a deep down clean. You may also find that it’s easier to get into certain nooks and crannies with your electric toothbrush that you couldn’t with a manual. We also recommend getting ADA-approved whitening toothpastes to keep up with your white smile. Talk to your Gig Harbor, WA dentist if you need recommendations for which whitening products to use. It’s never too late to schedule your next appointment with us. Call us if you want to put your next visit on the books. In the meantime, if you have any questions or concerns about your dental health, you can always call us. If you already see Dr. Michael Flatley twice a year for dental checkups, you are certainly doing your part to ensure that your smile remains clean and healthy; however, that’s not the only thing you need to do to have optimum oral health. You also need to be taking proper care of your teeth between these six-month visits to guarantee that you maintain healthy teeth and gums for years to come. Your Gig Harbor, WA dentist offers up the best ways to keep teeth as pristine as when you left the dentist’s office. While this might seem like a no-brainer, you would be surprised how many people don’t floss regularly, or at all! Flossing is probably one of the most important habits you can adopt to ensure that you have a healthy, clean smile between professional cleanings. Always use a generous amount of floss and gently glide it between your teeth and around each tooth. Be sure to use a clean piece of floss between each tooth so you don’t just push bacteria back into your mouth. Most people aren’t aware that they need to replace toothbrushes approximately every three to four months. Check out your toothbrush and see if the bristles are starting to fray. If so, it’s time to toss that brush and buy yourself a new one right away. Over time, harmful bacteria can get trapped in the fanned bristles, which can put debris back on your teeth or even make you sick. You won’t believe how many people don’t brush their teeth long enough. You may feel like brushing takes forever, but on average, most people only tend to brush their teeth for about 30 seconds. You should be spending about two to three minutes twice a day getting your pearly whites clean. Set a timer if you need to and really focus on cleaning every tooth. Hold yourself accountable for brushing for the proper amount of time and your smile will thank you. If it’s time to schedule your next dental checkup with your Gig Harbor dentist, Michael Flatley, DDS, call us today so we can get you in as soon as possible. And if you have other tips to share with our patients about keeping their smiles healthy, we would love to hear from you! Michael Flatley DDS and team are committed to helping the Gig Harbor community with their dental fears by offering complimentary sedation for new patients. A dental office regardless of its importance to your overall health can be a scary place. In fact, research shows that 50% of the population is fearful of the dentist and it is the number one reason people neglect their smiles. If you’re one of these people we can certainly empathize with your situation and have an offer of complimentary Sedation to help ease your dental anxiety. Schedule today by clicking the Appointment Request form or by calling 253-853-4955 today. If you are one of those who fear going to the dentist then you may be putting of necessary dental appointments and increasing the damage of your current dental issues. The problem is that your oral health is only going to continue to get worse and end up being more expensive and even end up causing more serious health issues. The good news is that you do not need to suffer through dental appointments. At Michael Flately DDS, our office is committed to working with you to ensure a bearable, even pleasant visit when you need dental care. That is why we offer complimentary sedation dentistry. 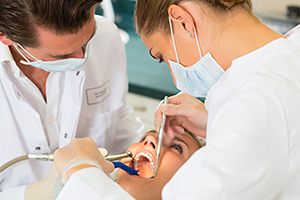 Sedation dentistry is the practice of providing varying levels of sedation to dental patients with the goal of easing their anxiety and allowing them to relax during their appointment. There are two more common types of sedation that we offer and we work with you to determine which method best suits your needs. Oral sedation uses prescribed medications that have varying degrees of anti-anxiety effects and sedation effects. The most common medications used are benzodiazepines, which are better known by their trade names, such as Valium, Halcion, Ativan, and Xanax. Dentists prescribe these medications based on your individual needs and they are safe when used as directed. Nitrous oxide, commonly known as “laughing gas,” is the most common form of sedation. The sedative is administered through a tube connected to a hood, or mask, that you wear over your nose on the day of your appointment. You will breath in the gas and become calmer and less anxious. You may fear the dentist but you do not need to avoid your appointments any longer. We will work with your dental anxiety or dental phobia to ensure that you get the oral care you need in the most relaxed manner possible. Schedule through our Appointment Request form to receive your no obligation walk through and to get acquainted and comfortable to prepare you for your sedation dentistry experience. Please note: Some restrictions apply. Not all patients will qualify to receive sedation medication. A thorough diagnosis, treatment plan and prescription are required prior to dispensing any medication.